For educational institutions in the state of New York, see education in New York (state). This article is about an art movement. It is not to be confused with the New York school of photography, spanning the 1930s to 1960s and identified only in retrospect. The New York School was an informal group of American poets, painters, dancers, and musicians active in the 1950s and 1960s in New York City. They often drew inspiration from surrealism and the contemporary avant-garde art movements, in particular action painting, abstract expressionism, jazz, improvisational theater, experimental music, and the interaction of friends in the New York City art world's vanguard circle. Frank O'Hara was at the center of the group before his death in 1966. Because of his numerous friendships and his post as a curator at the Museum of Modern Art, he provided connections between the poets and painters such as Jane Freilicher, Fairfield Porter, and Larry Rivers (who was also his lover). There were many joint works and collaborations: Rivers inspired a play by Koch, Koch and Ashbery together wrote the poem "A Postcard to Popeye", Ashbery and Schuyler wrote the novel A Nest of Ninnies, and Schuyler collaborated on an ode with O'Hara, whose portrait was painted by Rivers. Ron Padgett and Ted Berrigan both came to the group from Tulsa, Oklahoma. Except for Ashbery, all lived in New York during their formative years as poets. All four were inspired by French Surrealists such as Raymond Roussel, Pierre Reverdy, and Guillaume Apollinaire. David Lehman, in his book on the New York poets, wrote: "They favored wit, humor and the advanced irony of the blague (that is, the insolent prank or jest) in ways more suggestive of Jasper Johns and Robert Rauschenberg than of the New York School abstract expressionist painters after whom they were named." Concerning the New York School poets, critics argued that their work was a reaction to the Confessionalist movement in Contemporary Poetry. Their poetic subject matter was often light, violent, or observational, while their writing style was often described as cosmopolitan and world-traveled. The poets often wrote in an immediate and spontaneous manner reminiscent of stream of consciousness writing, often using vivid imagery. They drew on inspiration from Surrealism and the contemporary avant-garde art movements, in particular the action painting of their friends in the New York City art world circle such as Jackson Pollock and Willem de Kooning. Poets often associated with the New York School include John Ashbery, Frank O'Hara, Kenneth Koch, James Schuyler, Barbara Guest, Ted Berrigan, Bernadette Mayer, Alice Notley, Kenward Elmslie, Frank Lima, Ron Padgett, Lewis Warsh, Tom Savage and Joseph Ceravolo. 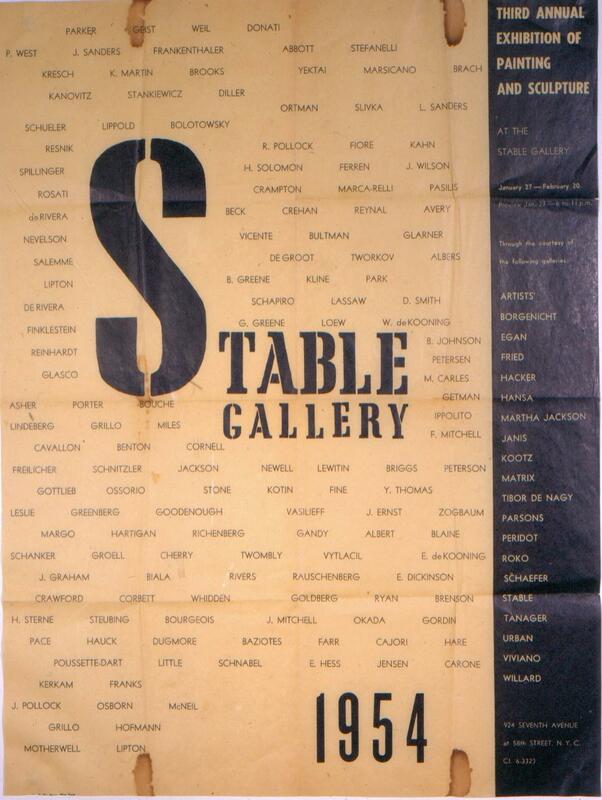 Other New York School artists, including those of the 1960s, have included painters Richard Pousette-Dart, Cecile Gray Bazelon, William Baziotes, Nell Blaine, Seymour Boardman, Ilya Bolotowsky, Ernest Briggs, Peter Busa, Lawrence Calcagno, Nicolas Carone, Nanno de Groot, Beauford Delaney, Lynne Mapp Drexler, Edward Dugmore, Amaranth Ehrenhalt, John Ferren, Perle Fine, Karl Hagedorn, John Hultberg, Albert Kotin, Clarence Major, Knox Martin, Misha Reznikoff, William Scharf, Ethel Schwabacher, Kendall Shaw, Thomas Sills, Merton Simpson, Hedda Sterne, and Jack Stewart. In addition, painter/sculptors Karel Appel, Claire Falkenstein, Betty Parsons, and Antoni Tàpies are known as members of the New York School. The Anita Shapolsky Gallery in New York City specializes in 1950s and 1960s New York School art, and exhibits expressionism, geometric abstraction, and painterly abstraction. It most frequently exhibits works in oil and acrylic, as well as sculpture. 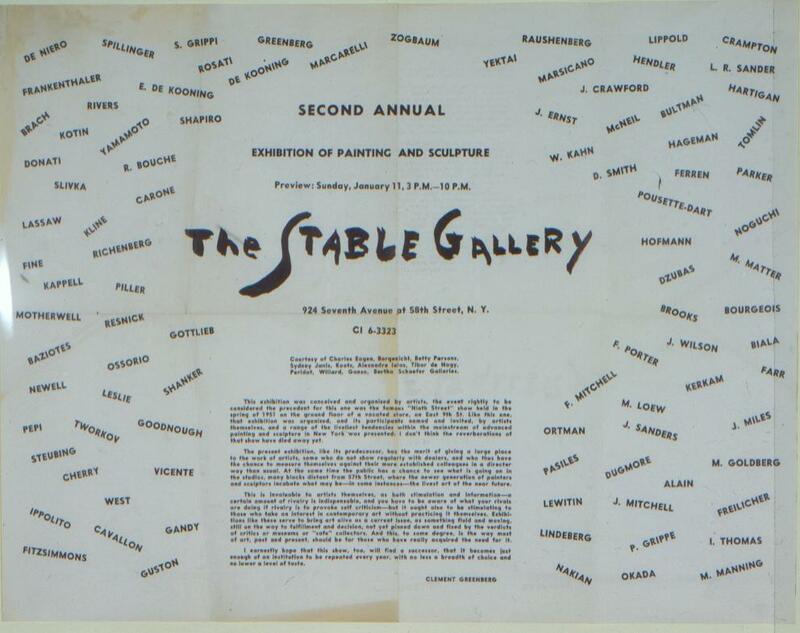 The Tibor de Nagy Gallery and Stable Gallery have also exhibited New York School art, and in 1998, the Gagosian Gallery also in New York City presented an exhibit of New York School art. The term also refers to a circle of composers in the 1950s which included John Cage, Morton Feldman, Earle Brown and Christian Wolff. Their music influenced the music and events of the Fluxus group, and drew its name from the Abstract Expressionist painters above. During the 1960s the Judson Dance Theater located at the Judson Memorial Church, New York City, revolutionized Modern dance. Combining in new ways the idea of Performance art, radical and new Choreography, sound from avant-garde composers, and dancers in collaboration with several New York School Visual artists. The group of artists that formed Judson Dance Theater are considered the founders of Postmodern dance. The theater grew out of a dance composition class taught by Robert Dunn, a musician who had studied with John Cage. The artists involved with Judson Dance Theater were avant-garde experimenatalists who rejected the confines of ballet technique, vocabulary and theory. 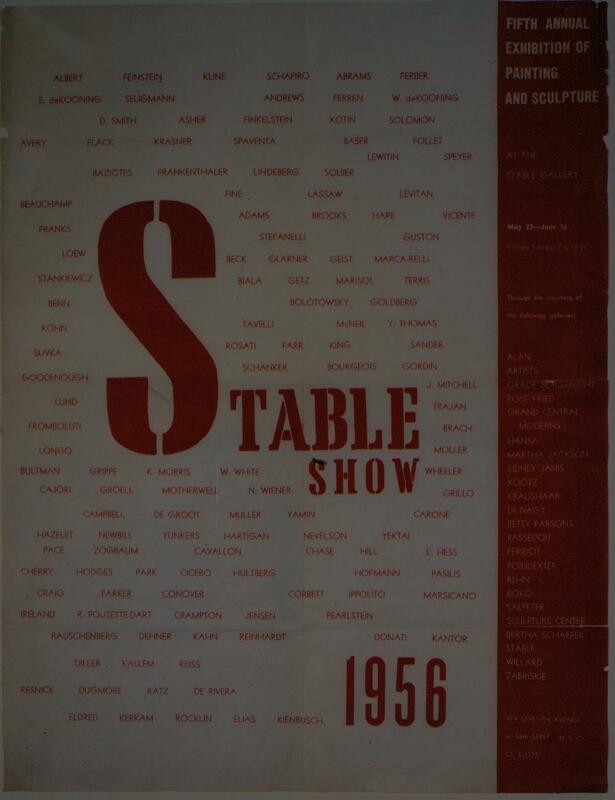 The first Judson concert took place on July 6, 1962, with dance works presented by Steve Paxton, Freddie Herko, David Gordon, Alex and Deborah Hay, Yvonne Rainer, Elaine Summers, William Davis, and Ruth Emerson. Seminal dance artists that were a part of the Judson Dance Theater include: David Gordon, Steve Paxton, Yvonne Rainer, Trisha Brown, Lucinda Childs, Deborah Hay, Elaine Summers, Sally Gross, Aileen Passloff, and Meredith Monk. The years 1962 to 1964 are considered the golden age of the Judson Dance Theater. During the 1950s, 1960s, and 1970s New York School artists collaborated with several other choreographer / dancers including: Simone Forti, Anna Halprin, Merce Cunningham, Martha Graham, and Paul Taylor. ^ "Peter Busa - Biography". Acme Fine Art. Archived from the original on October 3, 2013. Retrieved July 25, 2015. ^ a b c 2010 Artist's & Graphic Designer's Market. Writer's Digest Books. 2009. ISBN 1599635682. ^ Stephen Pace; Christine A. Berry; Lisa N. Peters (2011). Stephen Pace:Abstract Expressionist. Spanierman Gallery LLC. ISBN 1935617117. ^ Keith Eldon Byerman (2012). The Art and Life of Clarence Major. University of Georgia Press. ISBN 0820330558. ^ 2009 Artist's & Graphic Designer's Market – Listings. F+W Media, Inc. 2008. ISBN 1582976546. ^ Art Now Gallery Guide: National & international. 18. Art Now, Incorporated. 1999. ^ The Studio Museum in Harlem: Twenty-Five Years of African-American Art. The Studio Museum in Harlem. 1994. ISBN 0942949110. ^ Marcia G. Yerman (March 9, 2015). "A Conversation With Amaranth Ehrenhalt". The Huffington Post. ^ Peter Plagens (May 26, 2012). "Art Confronts Issues of War And Bigotry". The Wall Street Journal. ^ David Cohen (July 10, 2008). "The Location of the Second Generation". The New York Sun. ^ "The Writer's Brush". CBS News. December 16, 2007. ^ Magda Salvesen; Diane Cousineau (2005). Artists' Estates: Reputations in Trust. Rutgers University Press. ISBN 0813536049. ^ Marika Herskovic (2003). 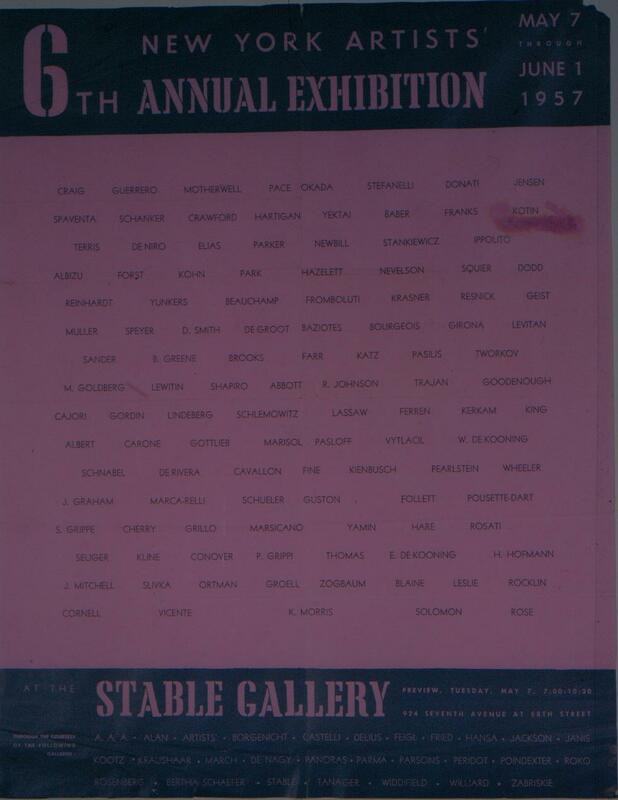 American Abstract Expressionism of the 1950s: An Illustrated Survey: with Artists' Statements, Artwork and Biographies. New York School Press. ISBN 0967799414. ^ "About". anitashapolskygallery.com. Archived from the original on March 7, 2015. ^ Jane Maulfair (August 7, 1987). "Her Concrete Love of Abstract Art Turned a Jim Thorpe Church into a Gallery". The Morning Call. ^ Cate McQuaid (January 31, 2015). "Helen Frankenthaler's art prompts new take on history at the Rose". Boston Globe. ^ "The New York School – March 17 – April 25, 1998 – Gagosian Gallery". gagosian.com. ^ See David Ni of Music and the Visual Arts, Routledge 2001, pp. 17–56. Philip Pavia; Natalie Edgar, Club without walls: selection from the Journals of Philip Pavia, New York: Midmarch Arts, 2007. Statutes of Liberty, The New York School of Poets, Geoff Ward, Second Edition, 2001. The New American Poetry, 1945–1960, Donald Merriam Allen, 1969. An Anthology of New York Poets, Ron Padgett (ed.) and David Shapiro (ed. ), 1970. Marjorie Perloff, Frank O'Hara: Poet Among Painters, University of Texas Press, 1977. The Last Avant-Garde: The Making of the New York School of Poets, David Lehman, 1998. Maurice Tuchman (ed. ), The New York School, Los Angeles: Los Angeles County Museum of Art, 1965. Dore Ashton, The New York School: A Cultural Reckoning, Penguin Books, 1979. Serge Guilbaut, How New York Stole the Idea of Modern Art : Abstract Expressionism, Freedom, and the Cold War, Chicago : University of Chicago Press, 1983.